Susan DuBois of the Buchan Branch in Aberdeen, Scotland travelled over three hours to Edinburgh to spend the night in below freezing conditions to raise money and highlight the plight of the homeless. Over eight thousand people, including Members of Parliament and celebrities, gathered as part of the event ‘Sleep in the Park’ organised by the charity ‘Social Bite’ as temperatures dropped to minus five Celsius (23F) in Princes Street Gardens, below Edinburgh Castle. 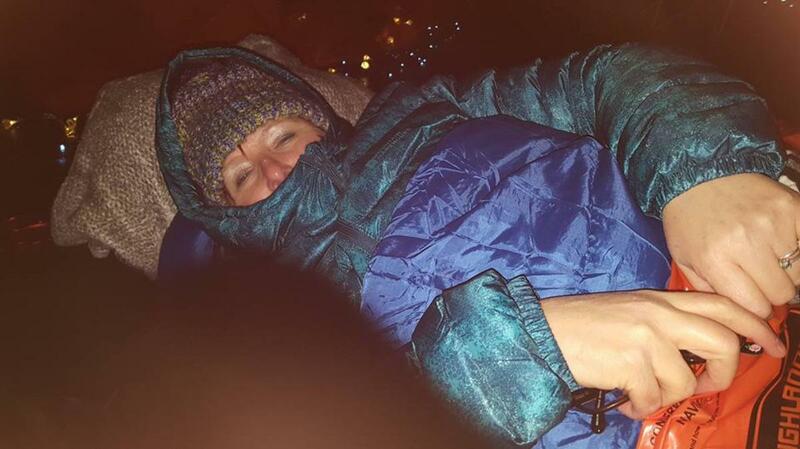 Susan commented, “Although our sleep out was extremely difficult, and I awoke to find a layer of ice on my sleeping bag, it was amazing to be connected with thousands of others in a common cause to try and make a real difference in the lives of others who find themselves in unfortunate circumstances. This experience has also allowed me to become more informed about the impact of homelessness on individuals, families and society as a whole. It has also given me an insight into the amazing work that is going on to support those experiencing homelessness and the difference the right kind of support makes in their lives as well as an understanding of what needs to be done to continue moving the work forward. I met a homeless man on the way to the park. He told me that he regularly sleeps in that park. I felt bad for him and kept thinking about him the whole night as I lay there freezing cold. I only slept out for one night and it was awful. That man and many others sleep out every night. Because of my experience, I feel an increase in love and compassion for the homeless and I certainly appreciate more how fortunate I am in my life. Participating in Sleep in the Park and raising money for the Social Bite Fund has also given me the opportunity to experience what I consider to be the true spirit of Christmas - kind and generous people giving willingly of their time and resources to help ease others burdens. This reminded me of Matthew 25: 35-40 where we read that the Saviour expects us to treat others in the same manner we would treat the Saviour. This sleep out is a wonderful demonstration of Christ like love. I am truly grateful for my “Sleep in the Park” experience. It has touched me to the core. I have truly felt a connection with those involved as well as those who supported me by donating to my fundraising page and by sending messages of encouragement. My son Matthew was born with kidney failure, and has spent twenty-two years of his life on dialysis. He eventually, after four attempts received a successful kidney transplant. As a receiver of such a selfless gift, we have experienced first-hand the impact of people giving unconditional Christ like love. We are so full of gratitude to the families who in their time of grief thought of others and made it possible for Matthew to experience life without dialysis. Matthew has epilepsy, learning difficulties and other complex health issues so he was unable to participate in the sleep out. He really wanted to be involved. He has been making hats on a knitting loom and has decided to donate them to a homeless charity. This has also allowed Matthew to experience the joy of being a giver of service and a contributor to society. Participants of the “Sleep in the Park” had to raise at least £100 to take part and donations had topped £3.6 million at the start of the evening. Following the event, Edinburgh Council announced plans to make 400 homes available to homeless in the city. The Saviour expects us to treat others in the same manner we would treat the Saviour.